Vanuatu is unique amongst nations that went through a period as a protectorate, as Vanuatu was a protectorate of 2 nations. Both France and Britain had settlers on the islands, which led to competing claims from people from both sides. So, in 1907, the British and French agreed to govern Vanuatu jointly. However, this consisted of both operating separate systems, but both ultimately accountable to a joint court. The British used a Blue Ensign to signify its governance, with a white disc on the fly. The disc enclosed "New Hebrides" Which was the name for Vanuatu at the time, and in the centre, a Tudor Crown. After the war, in 1953, the flag was altered slightly. The Tudor crown was removed, and replaced with St Edwards Crown. The French used the Tricolour as their flag, however, it was commonly defaced with a smaller French flag, and the British flag. Though they did rotate the Union Jack too far, meaning the flag was the wrong way round! Another version used the Free French flag, which had been defaced with the Cross of Lorraine. However, There was a unitary authority, the Anglo-French Naval Commission which was set up to protect the islands, and the islanders. Its joint flag was a vertical bicolour of white, and red. In the centre was a blue square, on which where 5 white stars. The French and the British decided to grant Vanuatu independence in 1980, however, independence did not go smoothly. The political movement, Nagriamel tried to promote a village focused, traditional way of life. It declared the island of Santo to be a new independent republic, Vemerana. This movement was backed by the Phoenix Foundation of the US who wished to see a tax haven established. Also, anti-independence French interests came into play. 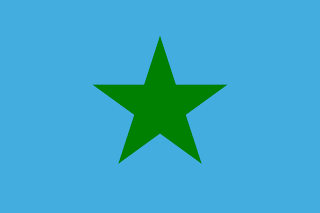 The flag they used was a light blue field, with a central green star. This triggered the short-lived Coconut War which started before independence, and ended just after it. The Vanuatu government called for British troops, only for the French to block them. Then, the local government called for troops from Papua New Guinea, who caused no casualties, apart from one. This brought about the ending of the Republic. Vanuatu itself gained its independence from Britain and France in 1980, and changed its name from New Hebrides to Vanuatu. The new government opted for the colours of red, black, yellow, and green. 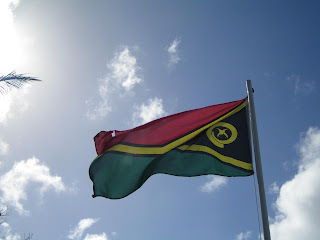 The green represents the richness of the islands, the red represents the blood of boars and men, the yellow represents the light of the Gospel (Vanuatu is 90% Catholic), and the black represents the ni-Vanuatu people. The flag is a horizontal bicolour of red, and green. The yellow is arranged in a narrow "Y" shape stretching from the hoist. The hoist also features a black triangle, and the yellow is fimbriated in black. In the hoist, is a yellow emblem, consisting of a boars tusk, a symbol of prosperity, and 2 fern leaves. The leaves represent peace, and the 39 fronds represent the 39 members of Vanuatu's legislative assembly.